Distillers Hydrometer (Proof and Tralle) - Texas Brewing Inc.
Distillers Hydrometers measure the density of your alcohol, moonshine and other distilled spirits on the Proof or Tralle Scale to get an approximate alcohol level. The hydrometers measurements are based on the fact that alcohol is thinner than water. The more alcohol that is present the thinner the liquid will be & the deeper the hydrometer will sink. To get an accurate reading alcohol can only be diluted with water, preferably distilled. Anything else that will alter density, such as bubbles from a faucet aerator, any solids, sugars or flavorings will cause a false reading. 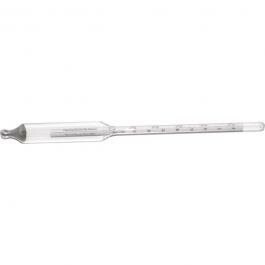 This hydrometer will not work on sweetened alcohol, wine or beer.